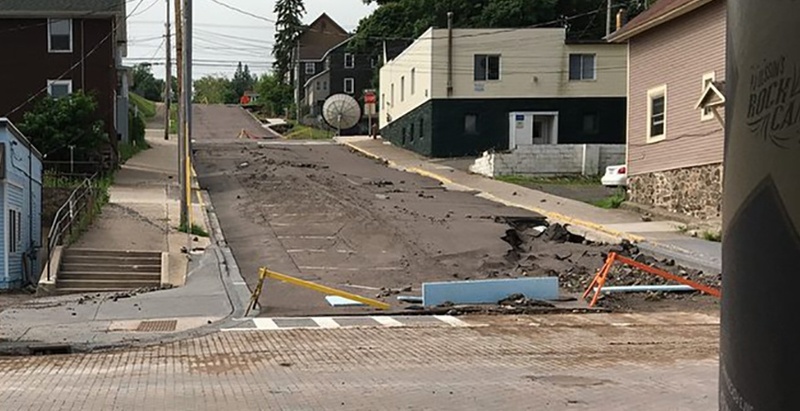 MCL Industries, Inc. and Bay Tek Games each donated $25,000 for a total of $50,000 to help the residents of Houghton County, MI recover from the floods that devastated the region on June 16 and 17. The companies also donated two dehumidifiers and 11 box fans to assist in the recovery. MCL and Bay Tek are part of The Village Companies, a group of businesses in Northeast Wisconsin and Upper Michigan that share common ownership. One of those businesses is Northwinds Adventures, a 220-acre recreational camp just outside of Houghton, MI. While Northwinds Adventures avoided major damage during the flooding, Carl and Michelle Treankler, who operate Northwinds Adventures, reached out to their business partners for relief assistance. The $50,000 donation went to a fund set up by Saints Peter & Paul Lutheran Church in Houghton, MI. Church leaders will be using the money to buy supplies for cleanup crews, household repairs and to purchase food and water for victims, volunteers and workers. Northwinds Adventures is also offering free lodging to anyone who travels to Houghton to volunteer with the cleanup and recovery efforts.